The information here is intended to help authors provide the highest-quality figures for publication in JCI Insight. Note that during the production process, JCI Insight staff may resize, rearrange, and edit the figures so that they conform to JCI Insight style. Your figures should look sharp and crisp when viewed at 100% magnification in Photoshop. Note: Images created for use on the Web are usually 72 ppi and are not of sufficient quality for our purposes. Note that figures may appear large enough onscreen, but this may not correspond to a large enough print size. When all figure parts are combined, the figure along with its legend may not exceed 3/4 of one page (17.25 cm or 6.8 in. in height). If the figure and legend combined exceed this size, it may be necessary to separate the parts into more than one figure. Figures must maintain their original proportions. When resizing an image, make sure to change the height and width by the same percentage. No bold type should be used. Use Regular or Roman typeface. Use italics only for gene symbols or for genus and/or species nomenclature; do not use italics for emphasis. Capitalize the initial letter of each label; otherwise, use capitalization only as applicable (e.g., for proper names or acronyms). 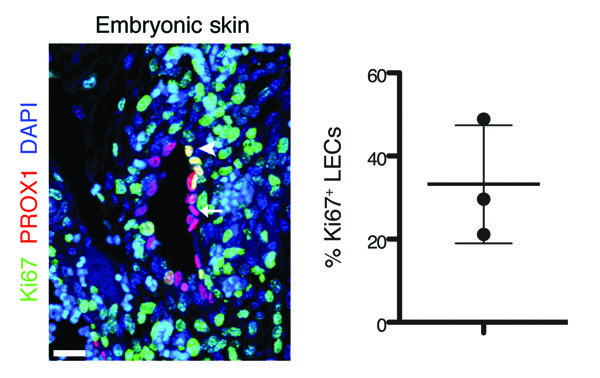 Spliced-together lanes of gels must be separated by a thin black line, and the legend must note that the lanes were run on the same gel but were noncontiguous. Inset photos - If multiple stained cells are composited into a single frame, a border must be drawn around the cells that were not originally included in the field of view. TIFF (tagged image file format) is best, but we can accept PowerPoint, high-resolution PDF, EPS, and Illustrator files. We cannot accept Canvas or Corel Draw files. Although your figures may be set at the correct resolution, creating or saving files as JPEGs will compress them and decrease their quality. If you have already saved as a low-quality file, you will need to go back to an earlier version. Do not blow up small files. This causes figures to become pixelated or blurry. If your file is too small to meet our size and ppi requirements, don't simply increase the size or ppi. Use an earlier version, before it was saved down to a small file. Compress all layers in TIFF files by flattening them. Ensure that grayscale images are actually in Grayscale mode. Use of the RGB or CMYK color scheme will unnecessarily increase the size of the file. If you are having trouble uploading your figures due to their size, you can use LZW compression in Photoshop when you save the figures as TIFF files. This should reduce their size significantly. Alternatively, you can ZIP your figures using any number of freely available software programs that will allow you to do this. Make sure that the bit depth of your figures is at 8 bits/channel. 16- or 24-bit figures unnecessarily increase file size. 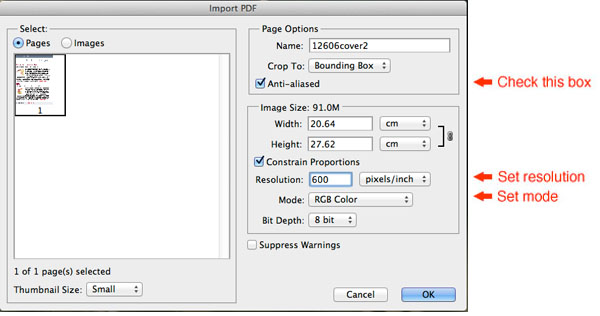 Reduce the size of files by cropping out unnecessary white space around the borders of your figures. Before inserting panels into PowerPoint, make sure each panel is at appropriate ppi and width. If you want all of your panels to be consistent in size, crop them appropriately before putting them into PowerPoint. It is not acceptable to resize them disproportionately. Do not resize the images in PowerPoint, because this causes them to become pixelated. Macintosh computer: Print to PDF file. PC: Save as high-resolution PDF file. Open file using Photoshop taking care to follow the instructions below. Resampling: Make sure this box is unchecked. This will ensure the pixel count remains unchanged. Constrained proportions: Keep this box checked. This makes sure the dimensions remain proportional when resizing the image. Resolution: Set the resolution at 600 ppi. Mode: Set the mode at RGB for images with color and "Grayscale" for other images. Anti-aliasing: Make sure this box is checked. Save this new file in TIFF format. Before inserting panels into Illustrator, make sure each panel is at the appropriate ppi and width. If you want all of your panels to be consistent in size, crop them appropriately before putting them into Illustrator. It is not acceptable to resize them disproportionately. 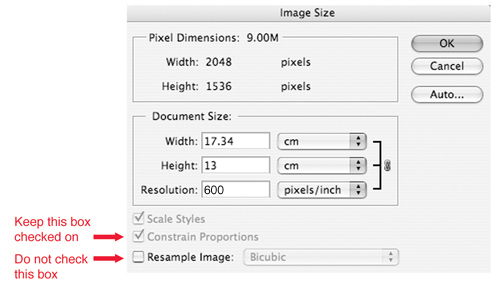 Be careful not to resize the images in Illustrator, because this causes them to become pixelated. Save file as EPS format file. Open file in Photoshop (see instructions above). Select the graph(s) you want to convert using the selection tool in Excel. Graphs of quantitative data must be presented in a manner that clearly shows the distribution of data and variation. In general, graphs should be presented as dot plots, with the average and the appropriate error bars indicated; or as box and whisker plots, with values defined in the legend (the bounds of the boxes, the lines within the boxes, the whiskers, and any outlying values). Presenting data as columns with error bars (dynamite plunger plots) is not permitted.